Chitwan usually refers to the Chitwan District, one of the seventy-five districts of Nepal. 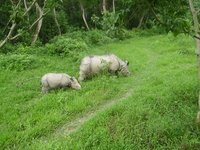 Chitwan is famous for Chitwan National Park ( a protected wildlife reserve). Chitwan National park is UNESCO world heritage site. People visit Chitwan to enjoy the wildlife adventure in Chitwan National Park. Sauraha is a small town in Chitwan. The Royal Chitwan National Park was established in 1973 and contains 932 square kilometres with a diversity of ecosystems-including the Churia hills, Ox-bow lakes, and the flood plains of the Rapti, Reu and Narayani Rivers. It is located west of Kathmandu at the foot of the Himalayas and is one of the few remaining undisturbed vestiges of the 'Terai' region, which formerly extended over the foothills of India and Nepal. It has a high biodiversity which makes this park unique in Nepal and wildlife includes one of the last populations of single-horned Asiatic rhinoceros and several dozens of Bengal tiger, although the last one is a matter of pure luck to see this elusive big cat. It is placed on the Unesco World Heritage List. Take a domestic flight from Kathmandu or Pokhara to Bharatpur Airport in Chitwan. Its is only a 20-minute flight to reach Chitwan. It takes about five hours to reach Chitwan by public transport like buses and micro buses from Kathmandu and Pokhara. Regular buses depart from the bus park of Pokhara and Kathmandu to Chitwan. We have a comprehensive list of accommodation in Chitwan searchable right here on Travellerspoint. You can use our map to quickly compare budget, mid-range or top of the range accommodation in Chitwan and areas nearby. This is version 7. Last edited at 3:54 on Aug 2, 17 by sleepBot. 1 article links to this page.